This is not your parents' League. Superman: I once thought I could protect the world by myself, but I was wrong. Working together, we saved the planet, and I believe that if we stay together as a team, we would be a force that could truly work for the ideals of peace and justice. The Flash: What, like a bunch of Super Friends? Superman: More like a... Justice League. The Flash: Do you have any idea how corny that sounds? This animated adventure series is Cartoon Network's update of Super Friends, with seven core heroes: Superman, Batman, Wonder Woman, Green Lantern (John Stewart), The Flash (Wally West), Hawkgirl and the Martian Manhunter. Existing in the same universe as Batman: The Animated Series, Superman: The Animated Series, Static Shock (post-retcon), Batman Beyond, and The Zeta Project, this show continued several story threads from those series and introduced new characters who had not previously appeared. Banding together for the first time to face powerful alien conquerors, Superman, Batman, Wonder Woman, The Flash, the Green Lantern John Stewart, Hawkgirl, and the Martian Manhunter officially organize themselves as a team, anticipating having to deal with other threats that they cannot face alone. This incarnation lasted two seasons and 52 episodes (most of which were two-parters, with three three-parters and a single standalone episode). To avoid overcrowding that would come with featuring every member in every episode, between two and five members would be in the focal point of a story and the entire League appeared only a few times. Turning most stories into two or three part episodes allowed for a much larger scope that could not be accomplished in 22 minutes. The successor series, Justice League Unlimited, added more heroes from DC Comics, many of whom had never before been animated. After the events of the second season, the League recruit heroes from around the world to be prepared for the most powerful threats. Instead of the two or three part episodes, this series returned to the single episode format, which allowed for more obscure heroes and minor comic arcs to be spotlighted. To balance this out, a very strong myth arc was formed telling of a government conspiracy against the League, picking up from a few previous episodes, not just from the first Justice League series, but all the way back from Superman: The Animated Series. In addition, the villains get desperate as they have to face against a very powerful and well organized Justice League and eventually create the Legion of Doom in response. This incarnation lasted 39 episodes and was the last show overall in the DC Animated Universe, eventually followed up years later by the release of the Batman and Harley Quinn animated film as well as Justice League vs. The Fatal Five animated film. Both iterations of Justice League were distinctive among superhero series for being true ensemble pieces. Pick any member of the core cast and in any given episode he or she might be the main hero of the story, used mainly as part of the larger team, or never even mentioned at all. Supporting cast members rotated out weekly, especially in Unlimited. In addition, while Jack Kirby's Fourth World creations were used extensively in Superman: The Animated Series, Steve Ditko's creations got the same treatment in this incarnation. For the comic this show was based on, see Justice League of America. For the 2017 live-action film, see Justice League. For the 2016 animated series, see Justice League Action. Justice League: Crisis on Two Earths: Notable for having started off as a movie bridging the gap between the end of Justice League and the beginning of Unlimited. While no longer set within the DCAU, the film retains many of the plot points and themes of the series. Justice League: Doom: A loose adaptation of the "Tower of Babel" arc, almost all roles are reprised by the animated series actors. note Michael Rosenbaum reprises his role as the Flash, albeit the Barry Allen incarnation rather than like the DCAU's use of Wally West. Additionally, Superman is voiced by his original DCAU voice actor, Tim Daly, as opposed to George Newbern. Hal Jordan is voiced by Nathan Fillion, reprising his role from Green Lantern: Emerald Knights, as opposed to his Firefly co-star Adam Baldwin, who provided Hal's voice for his brief appearance in Justice League Unlimited. Justice League: The New Frontier: A direct adaptation of the famed comic book DC: The New Frontier. 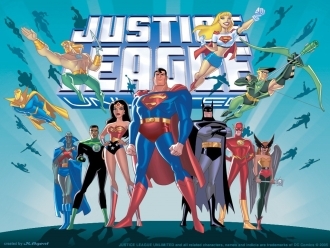 Although it has a scope larger than just the League and more the general DC universe, it was renamed to include the Justice League in the title. Justice League: The Flashpoint Paradox: An adaptation of Flashpoint, it's still a Flash-centric but the League (or lack thereof in the changed timeline) plays a central story. Justice League: War: An adaptation of the New 52 version of the origin of the Justice League, as they band together to face an invasion of Earth via Darkseid. Loosely a sequel to The Flashpoint Paradox. Justice League: Throne of Atlantis: A direct sequel to Justice League War. After previously leaving Aquaman out of the origin story, he shows up and joins the League to thwart a plot against the surface by Orm the Ocean Master. Justice League vs. Teen Titans: The two super hero teams come to blows concerning Raven and her connection to her demonic father Trigon. The Injustice: Gods Among Us video game series also features the reprisals of numerous charactersList George Newbern as Superman, Susan Eisenberg as Wonder Woman, Kevin Conroy as Batman, Phil La Marr as John Stewart, Adam Baldwin as Hal Jordan (replaced by Steve Blum in the sequel), Carl Lumbly as Martian Manhunter, Jennifer Hale as Killer Frost., but also does not take place in the DCAU. Now has a Best Episode Crowner and a developing episode guide. Due to the number of tropes present, the page has been split into two sections.